Mesa police are asking residents to be on the lookout for an elderly woman who went missing from a care facility early Thursday morning. Mary O'Sullivan-Schultz, 70, reportedly went missing around 2 a.m. in the area of Higley and Broadway roads. Officials say she was last seen heading in a northwest direction on foot at her care facility. Schultz has Alzheimer's and is bipolar. She does not have any medication with her that she needs for anxiety and high blood pressure. Police say she was last seen without shoes, wearing a white shirt and green pants. She is 5 feet, 7 inches tall, 154 pounds, has red hair and blue eyes. "We warn people about not having their animals out, and my mom is out with no shoes on in this extreme heat," Leigh Schultz, Mary's daughter told ABC15. 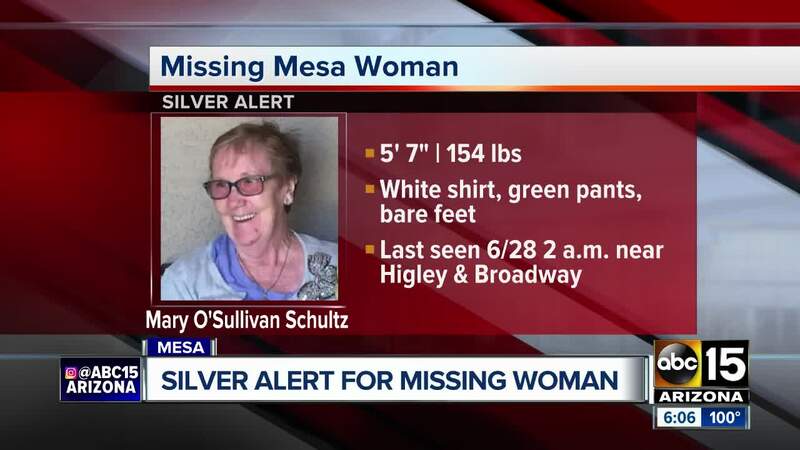 Mesa police say they're asking for the public's help locating her, as she may have wandered onto an empty property or may be in an area where residents are out of town. They're hoping Mesa residents can check their properties and keep an eye on the homes of neighbors who may not be there to look for themselves. 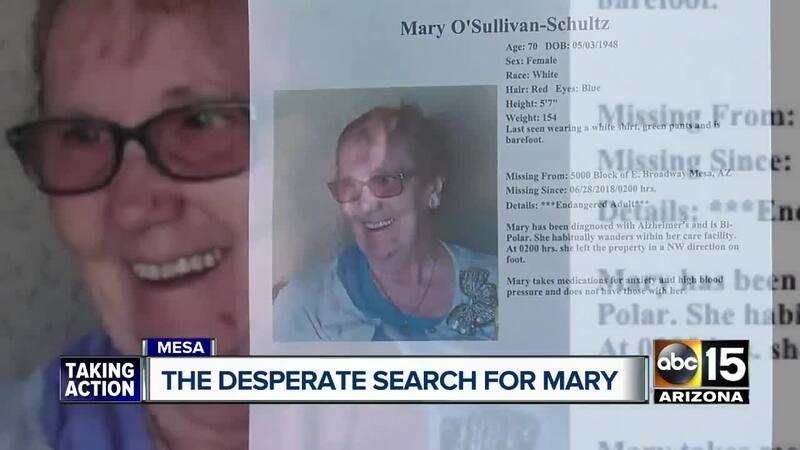 "We are asking people to check their backyards, check their sheds, see if they can find her somewhere because we're guessing she sought refuge from the heat," Mary's daughter-in-law Rachel Schultz told ABC15. Anyone with information on her whereabouts is asked to call 480-644-2211.